Gifts from the Pirates: "For me, drawing generates thinking and vice versa." "For me, drawing generates thinking and vice versa." Opeie has really started getting into his drawings recently. If he see's a pen lying around then the lid comes straight off and the adventure begins for the search for some paper. 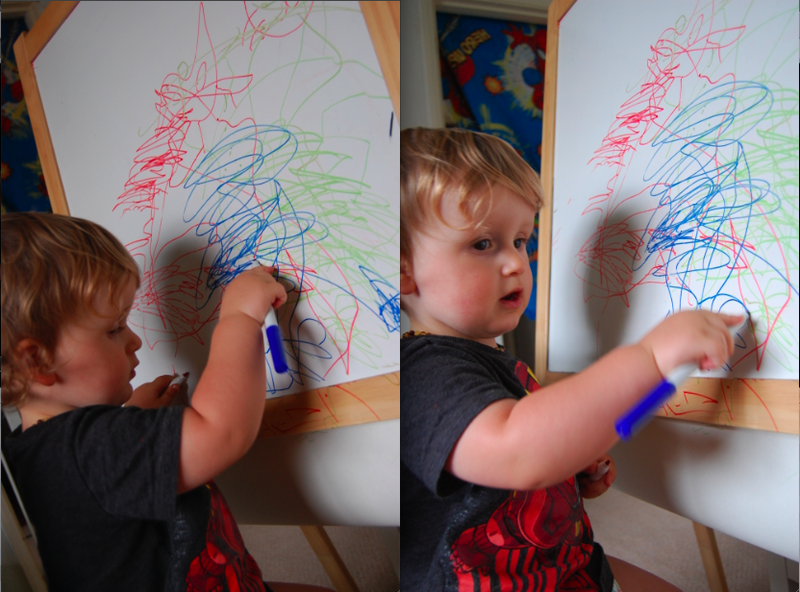 I love watching him get carried away in his own little world of squiggles and doodles. I used to draw a lot when i was little although i don't remember anything from around Opeie's age so I'm not sure if i enjoyed it then. If not then i definitely made up for it when i was at school and onwards. My dad really encouraged my drawing and i remember sitting with him on many occasions just sketching things that i loved, i remember being especially proud of a drawing of roger and Jessica rabbit, which i really wish i still had. For that reason i will always keep the boys drawings somewhere safe. I recently helped my dad move house and he had found a box of cards and drawings from when i was younger which was really nice to look through. I will write a post about it soon. Both myself and Mrs M are very arty so we will always motivate the boys to draw, its a great way to express yourself and as i have said many times before their drawings are always great for birthday and Christmas cards. I love how Opeie wants to use every single colour when he is creating his masterpiece but my favourite thing about his artistic ways on this occasion is that he saw my hand as an extension of his work. I spent much of the afternoon trying to convince myself that it was a great idea for a tattoo but sadly after doing the washing up that night it all just merged into one big mess. Thankfully Opeie isn't one of those children that thinks it is Ok to draw on the walls but that might be due to the fact that there is actually some walls in the house that he is allowed to draw on. Thanks to a set of tile crayons that Mrs M brought, Opeie can now express himself in an artistic manner in the bath too. No piece of paper in the house is safe so we have to be careful there are no important documents in his reach. I was writing a shopping list earlier and he cuddled up next to me clutching a felt tip pen and began to add his own thoughts to the paper. I think its great though and i really hope that he is always like this. With me and Mrs M as his parents then I'm sure he will be, plus Seth loves drawing to. and Opeie loves getting involved in whatever Seth is doing.